With all the switcheroos that have taken place with UFC 153’s roster over the past couple of days, it’s easy to get confused with what the show’s official lineup actually looks like. Thankfully, the organization has released the event’s 13-bout agenda to help clear the air. To make up for all of the drama, the main card will feature six scraps instead of the customary five. 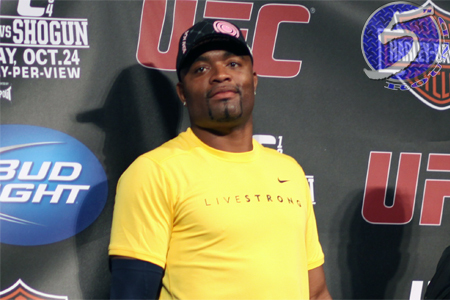 Featherweight champ Jose Aldo and Frankie Edgar are out as the night’s featured attraction, and middleweight king Anderson Silva (Pictured) and Stephan Bonnar are in. The pair will compete in a light heavyweight affair. Another 205-pound tango between Glover Teixeira and Fabio Maldonado serves as the co-main event. Heavyweights Dave Herman and Antonio Rodrigo Nogueira get the card’s third-to-top billing. Jon Fitch vs. Erick Silva, Phil Davis vs. Wagner Prado and Demian Maia vs. Rick Story round out the live pay-per-view broadcast.